Build to a big finish. Then leave ‘em wanting more. That should be the overall goal of any serial drama series. And in the case of Netflix’s House of Cards, “Mission Accomplished.” Or to put a more believable spin on it, Season 4 has been very well positioned by the final scene of Season 3. All 13 episodes again are ready for viewing at whatever one’s pace. I’ve found that it’s best to devour the whole thing before making any critical judgments. Reviewing Season 3 after watching the handful of episodes made available in advance by Netflix is like leaving a baseball game in the 5th inning after the home team gets down by five runs. A lot can still happen. 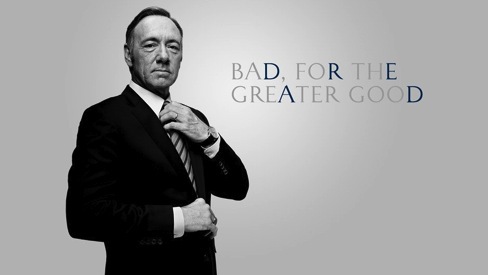 Season 2 ended with Francis “Frank” Underwood (Kevin Spacey) conniving his way to the presidency after duping the ineffectual incumbent into resigning. Wife Claire Underwood (Robin Wright), his longstanding partner in throat-cutting duplicity, still stands firmly by her man. Still, she’d also like to bloom on her own. Season 3’s opening hour otherwise largely belongs to Frank’s former chief of staff, Douglas Stamper (Michael Kelly). He was left for dead at the end of Season 2 after being beaten with a brick by prostitute/lover/possibly dangerous informant Rachel Posner (Rachel Brosnahan), who thought Stamper was planning to kill her. Stamper’s slow, agonizing recovery is the focal point of Episode 1, with Kelly standing out as an emotionally and physically wounded loyalist who will and has done anything for his boss. All he wants is his job back, but the Underwoods keep putting him off while placating him. Frank very much wants an elected term in his own right, and the 2016 presidential campaign already is upon him. His centerpiece initiative is “America Works,” a full employment jobs package that would come at the expense of Social Security and Medicare for future generations. It faces strong opposition, as does Frank from his own Democratic Party in terms of being the 2016 nominee. Although showing traces of emotional vulnerability -- mainly while with newly hired presidential biographer and bestselling author Thomas Yates (Paul Sparks) -- Frank isn’t about to become anyone’s gooey nougat. House of Cards also becomes immersed for a while in an international effort to deploy a multi-nation peace-keeping force in the Jordan Valley. It’s mainly a device to introduce a vivid new character and mockup for Vladimir Putin. He’s Russian Federation president Viktor Petrov (Lars Mikkelsen), who’s every bit as ruthless as Frank. Meanwhile, Claire lobbies hard to be the U.S. ambassador to the U.N. And Frank hopes to head off one of his principal adversaries in the presidential campaign by offering solicitor-general Heather Dunbar (Elizabeth Marvel) a seat on the U.S. Supreme Court. Whatever the subplots and subterfuges, this series hinges, as always, on the dynamics between Frank and Claire Underwood. They’ve been combustible before, but never quite like this. “We’re murderers, Francis,” she tells him in a very strong Episode 6. Any slack points in Season 3’s mid-section are offset by some tremendous episodes down the stretch, beginning with Hour 10. The dialogue crackles while Frank increasingly finds himself isolated and under fire. “Such a pity how much ruthless pragmatism gets weighed down by family values,” he carps to the camera. Season 3 includes the usual gaggle of real-life national media notables playing themselves. Episode 1 finds Stephen Colbert twitting Frank in his now outdated venue, The Colbert Report. Others in the mix are Jake Tapper, George Stephanopoulos, Meredith Vieira, Chuck Todd, Donna Brazile, Matthew Dowd and John King, who gets the most to do as moderator of a hard-punching presidential debate tied to the Iowa caucuses. The addition of biographer Yates is mostly a plus. He ends up serving as a muse for both Underwoods, feeling their pain in the interest of serving his own interests as an author with a stated addiction to deep personal undercurrents. Watchful viewers might wonder at the sudden departure of Republican Senate Majority Leader Hector Mendoza (Benito Martinez of The Shield), who was positioned in early episodes to be a strong adversary of the Underwoods. Instead, it’s said almost in passing that Mendoza had to step down because of an ethical impropriety -- as if that would be grounds for anyone’s dismissal in House of Cards. In truth, Martinez opted to join the cast of ABC’s new American Crime, where he has a key role as an old-school, widowed Hispanic father of two troubled teens. House of Cards is still playing with a full deck and the only imperious King and Queen it needs in Frank and Claire Underwood. Squint just a little and perhaps you’ll see Richard Nixon and Hillary Clinton. Whatever your takeaway, the performances of Spacey and Wright remain assured and now ingrained in a series that ranks as the best body politic drama ever. The only serious contender, NBC’s The West Wing, sought a higher ground in answer to idealistic higher callings. The Underwood White House is run a little differently and, alas, more realistically. Staying in power is paramount. Whatever it takes is the only lesson to live by.